Flash Flash news for the Bank Aspirants is here. Want to hear what is that update.. We will not make you wait to know that update. That one is IBPS RRB 2018 Notification is live now. So bank job passionate candidates know about the IBPS RRB 2018 Syllabus to get the bank job near to your locality. If you want the positive result in this IBPS RRB Exams, then you have to study the IBPS RRB Syllabus 2018. If you do the proper learning of IBPS Syllabus, then only you can dream of achieving this bank job. Much search is not required for IBPS PO, Clerk Syllabus, our page gives all the syllabus topics. So just follow them or else you can download it without paying a single rupee. check more Employment news at our site. Institute of Banking Personnel Selection has given the IBPS RRB Syllabus 2018 for the the candidate’s preparation purpose. Along with syllabus, candidates can see IBPS Office Assistant and Officer Scale-I Exam Pattern here in this page. The heights of competition in Bank exam is unpredictable. Year by year the cut-off goes on increasing. So at any situation, don’t neglect the IBPS RRB Officer Scale-I Syllabus preparation if you are a serious bank aspirant. Other than preparation, no short cut is available to get this IBPS Bank Job. If you study and practice hard and well performed in the exam, then you will get this job. Or else forget about this job. The lines we have presented are very true bank aspirants. 0.5 mark also effects your selection in these type of jobs. Hence read the IBPS RRB Syllabus with presence of mind. Catch up the latest Bank Jobs here at our site. For 101910 Officer Scale-I, II, III and Office Assistant Posts, this single notification is released. But the IBPS Selection Process varies as per the post designation. Here IBPS Exam Pattern 2018 of all the posts are given. One by one you can check that pattern here. For IBPS Office Assistant, there is no interview round. Only prelims and mains exams will be conducted to select the candidates. On the other side, for IBPS Scale I Officer , there are prelims, mains and interview. All three rounds has to be faced and gets qualified. But for IBPS Officer Scale-II only a single exam is there. So by downloading the IBPS RRB Syllabus from the below links you will came to know the whole IBPS Prelims, Main Exam Pattern with syllabus. This IBPS RRB PO, Clerk Prelims Exam Date are 11, 12, 18 August 2018 , 19, 25 August And 01 September 2018. Applicants has to complete the Updated IBPS RRB Office Assistant Syllabus at least one week before the prelims exam date. That one week time can be utilized for the previous papers revision purpose. The bank jobs recruiting system for many banks like Andhra Bank, Syndicate Bank and many other is this Institute of Banking Personnel Selection, in short called as IBPS. In every financial year, for all the bank jobs vacancies this IBPS release recruitment notifications. Among that notification, this IBPS RRB 2018 Notification is the one. After getting the assurance that you are an eligible candidates for these IBPS Exams, in the next moment start analyzing the IBPS PO, Clerk Exam Pattern. (Objective) Test Name Marks Qns. Duration. Get www.ibps.in IBPS Officer Scale-I,II, Office Assistant Syllabus by this latest post. We furnishes latest IBPS RRB Exam Syllabus 2018 exclusively. Our aim is maximum number of candidates has to receive the job offer letter by follow the information of syllabus details given in this page. So with lot of effort we have published the apt IBPS RRB Syllabus with out unnecessary topics. Read these topics only in the available shorter time. Yes, very less time is there for the preparation. So start preparing from today itself. All the Best!!! 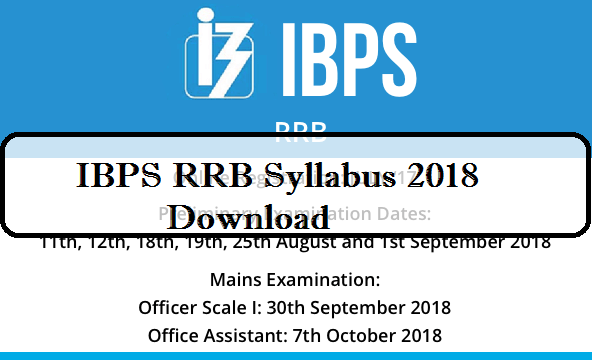 How to Download IBPS RRB Syllabus 2018? Go to the Left Section of the page i.e. CRP RRB’s or in the home page only there is a link of the latest IBPS RRB Notification. In the notification only the IBPS Officer Scale-I, II, Office Assistant Syllabus and Exam Pattern is given. It is the best thing if you read the topics by taking the print out of the syllabus.